Take a look at the picture above. This is for a 2017 Jeep Grand Cherokee with a little over 12,000 miles. NOT a brand new Jeep. It probably has a $21,000 price tag on the window. Which depending where you are, can be a great deal for a Jeep, specially if it has all the bells and whistles! But notice that "Finance Charge" of $11,700? What is that? And how did your price of $21k just jump to a total price of $47,000?! 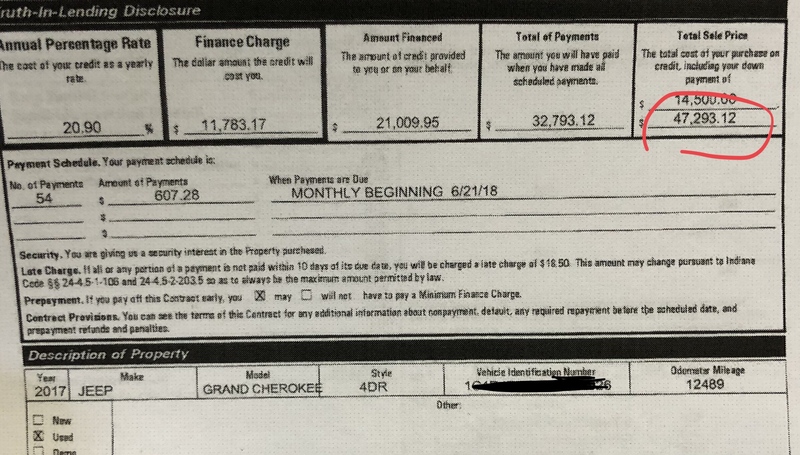 When you look at the payment of $607/month for 54 months, that still equals $32k. WHAT! Thats right - your APR rate. I have seen them anywhere from 2.9% to 34% APR. What does that mean and how do they calculate it? When a dealership tries to get you financed through a bank or lender (lien holder), they send all your provided information over to them. Income, Rent, Monthly Bills and of course, your Social Security Number. When a lender does a pull on your SSN, it will generate your credit worthiness, aka, your credit score. They also take into account your bills, income and any outstanding debts - resulting in your APR. The better your credit is and financial history, the better your APR is. Have a few repos in the past, maybe a bankruptcy? You may be paying a higher interest rate! But wait, there is more. The dealership you are buying a car from HAS NOTHING TO DO WITH YOUR CREDIT. You can go from dealership to dealership trying to find a better financing option, but most large dealerships all deal with the same lenders. This just puts MORE negative hits on your credit. And if possible, stay away from buy here, pay here lots. They almost always have through the roof APR rates! It can be overwhelming! So how should you be car shopping? Family Watchdog suggests finding a few options within your budget. Search around on car dealerships with good ratings and reviews. Once you have a few dealerships in mind, cruise the lot to see what they have within your budget. Always take someone who is car-smart with you to check out the vehicle. When you find the car you like, at the dealership you like, you can then apply for your loan. Just make sure to read ALL the fine print before signing a loan. Remember, in most cases, once that loan is signed, there is no returning that car without the possibility of damage to your credit score. I wish they would have taught this to me in school when I was younger. But it's something I have learned the hard way over the years. Hopefully we can learn together and teach our kids from our mistakes! It always helps to do a ton of research on financing as well as the vehicle (or product) you are choosing to finance beforehand. That way you can go into the dealership with your head on straight and ready to take on a new prized possession!